Last Night's Fun's is a sparking celebration of music and life that is itself a literary performance of the highest order. Carson's inspired jumble of recording history, poetry, tall tales, and polemic captures the sound and vigor of a ruthlessly unsentimental music. 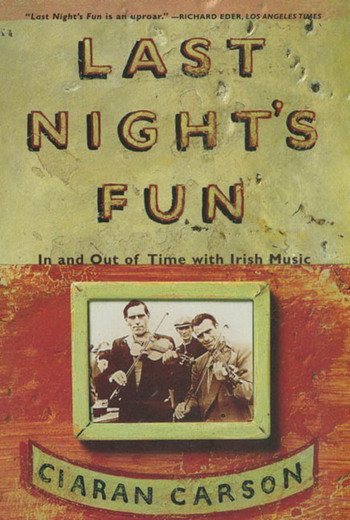 Last Night's Fun is remarkable for its liveliness, honesty, scholarship, and spontaneous joy; certainly there has never been a book about Irish music like this one, and few books ever written anywhere about the experience of music can compare with it. Ciaran Carson was born in 1948 in Belfast and works for the Arts Council of Northern Ireland. He is the author of The Pocket Guide to Irish Music, The Star Factory, as well as five collections of poetry, one of which, First Language, was awarded the T.S. Eliot Prize.